In April 2017, a study by UC Berkeley titled The roles of impact and inertia in the failure of a shoelace knot was published by The Royal Society A, Mathematical, Physical and Engineering Sciences. I found myself fielding requests for comment about their research from all over the world and even participated in two BBC Radio interviews. The following is my detailed critique of this research, with some startling revelations. This critique has since been published by the Royal Society A alongside the original paper. The researchers' initial observations were that a shoelace knot, particularly one tied with a weak Granny Knot, often came undone fairly quickly while walking. However, that same knot didn't fail if the person either sat on a desk and swung their foot backwards and forwards a similar number of times without ground contact or if they stomped their foot on the ground a similar number of times without any swinging. 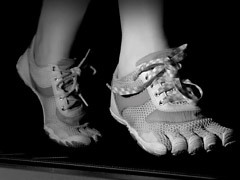 This suggested that the interplay of both swinging and stomping forces experienced while running or walking was required for a shoelace knot to untie itself. Using a high-speed video camera, a person's granny-knotted shoes were filmed while running on a treadmill to observe the mechanics of what actually happened when the knot came undone. This confirmed that the "whipping" of the loops and free ends of the shoelace helped to pull the knot loose. 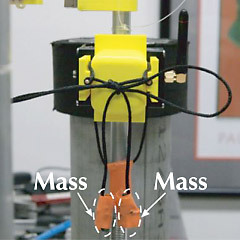 A test rig was constructed, comprising a pendulum arm with a test knot attached. This arm was repeatedly pulled from vertical and allowed to swing back to vertical and bump against a "wall". This was calibrated to bump at about the same g-force as a foot striking the ground while walking (approx. 7 × gravity). Testing involved repeatedly bumping for a 15 minute period – or until knot failure – and measuring the amount that the ends had slipped from their initial length. Initially I wondered why their setup was oriented to bump against a wall instead of against the ground. The reason was not stated in the paper, but I'm guessing that this orientation allowed the loops and loose ends to hang downwards, simulating how those of a forwards-moving foot would be orientated ahead of the knot. In order to "magnify" the inertial effect of the free ends, masses were added to the ends. Testing with progressively greater masses from 1 gram to 3 grams produced progressively greater rates of slippage, and in turn, more rapid / frequent knot failure. Finally, the knot was tested in various orientations: with the whole knot oriented at either the front of the pendulum or to the side of the pendulum, and with the loops and loose ends oriented either horizontally ("across the shoe") or vertically ("along the shoe"). I won't go into the results in detail, as these can be found in full in the published paper. In general, their results quite convincingly corroborated previous Granny Knot tests as well as backing up my own advice that excessively long shoelaces are more likely to come untied because the loops and loose ends "flop around" more. Their other finding – that the directions of both impact and swing influence the untying – is the subject of one of my criticisms, as detailed further below. No results were published for the number of "weak" knots (ie. Granny Knots) that failed completely without end masses attached. For the "strong" knots with no end masses, there was negligible slippage and zero total failures. It's possible that Granny Knots performed equally well. It's thus also possible that the testers resorted to adding end masses when their original test setup failed to give measurable results. No images were published of the templates used to guide the tying of the knots. My own website shows three different techniques that produce the identical "standard" shoelace bow, while differences in the way the loops and ends are pulled or twisted during tightening further influence the finished shape and integrity of the knot. No clear images were published of the knots before, during or after testing. The testing used black shoelaces, which are very difficult to observe, photograph or film. The usual shadows where shoelace segments overlap are lost in the dark, making it much harder to visualise those overlaps. The few images and videos that were published using those black shoelaces made it more of a challenge to interpret, verify or critique the experiments and results. I have several criticisms of the testing methodology, including lack of scientific discipline, missing important contributing factors, or missing the whole point that Granny Knots are the chief cause of shoelace knots coming undone for the average person under normal circumstances (ie. without heavy attachments on the ends of their shoelaces). The only published photo of the "weak" knot was one showing the two different orientations (horizontal bow vs vertical bow), part of which I've reproduced at right. As mentioned above, the black shoelaces lacked sufficient contrast to check the construction and placement of the knot. I've therefore Photoshopped the image to enhance the crossovers in the very centre of the knot. Initially I was puzzled, as the image did not match either a left-over-right Granny Knot or a right-over-left Granny Knot. The only way that I could reproduce this knot with similar looking crossings and orientations of loops and ends was to tie a right-over-left Granny Knot, then flip it (see photos below). In other words, their knot appears to be mounted on the test rig "inside-out", with what is normally the outer, second knot instead positioned underneath the first knot and pressing against the yellow knot-mounting block. This would likely produce quite different results than those with the knot correctly mounted. Compare my photos (below) of a right-over-left and a left-over-right Granny Knot, each both normal and flipped, against UC Berkeley's Granny Knot photo (above). 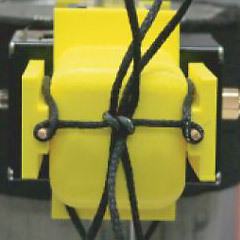 During rear-impact testing, the ends – which are dangling downwards – partly land against the yellow knot-mounting block, altering and shortening their swing. In addition, the ends then collided with the lower part of the metal bar of the pendulum, sometimes arresting their swing and sometimes wrapping around that bar. During side-impact testing, the ends would have suffered no such interference to their swing. Little wonder that the side-impact test – with its unrestricted end movement – resulted in greater slippage and knot failure using smaller end masses than the rear-impact test. That said, I actually agree that the direction of impact could well have an effect. It just needs to be tested with fewer variables. During each step in a typical shoe, the curvature of both the top of the foot and the shoe upper flatten under load and are restored after push-off. Those curvature changes would in turn would alter the angles of the shoelace segments entering the bottom of the knot, changing the knot's shape and friction profile. However, in the test setup, the lace segments entering the bottom of the knot are kept straight, likely negating many of those important load+release effects. A setup that mimics the change in profile of the shoe upper during load+release could better explore those effects. Quote 1: "We were able to show that the weak knot will always fail and the strong knot will fail at a certain timescale, but we still do not understand why there’s a fundamental mechanical difference between those two knots." Quote 2: "While the inferior performance of the weak version is well known in both common knot lore and surgical knot literature [1–4], we have yet to find a proposed structural characteristic to explain the inferior behaviour." Quote 3: "This is the first step toward understanding why certain knots are better than others, which no one has really done." Quote 4: "There are two ways to tie the common shoelace bow tie knot, and one is stronger than the other, but no one knows why." Really? No one knows why? A quick Google or YouTube search for "Why shoelaces come undone" would have found plenty of information about Granny Knots. My own video – coincidentally titled: Why shoelaces come undone – contains a close-up of the innards of a correctly tied shoelace knot, which I describe as "self-tightening", versus a Granny Knot that "slips". Let's face it, they didn't even ask me – Professor Shoelace! The self-proclaimed world's shoelace expert. Inventor of several different shoelace knots. Whose website ranks #1 worldwide for shoelace-related queries. I would have been happy to answer their questions, advise them in their research or to peer-review their paper. "The difference is due to the adjacent contact points within the finished knot. In the balanced shoelace knot, tension on the bottom part of the knot (due to foot movement) will actually pull the adjacent top part of the knot tight. In the un-balanced "Granny Knot", the adjacent contact points run in opposite directions, so the same tension on the bottom part of the knot will actually work the adjacent top part of the knot loose." In closing, it's not that I'm peeved that they didn't ask my expert opinion – I really do believe that this constitutes a lack of research. NOTE: I've since created a follow-up video that shows in detail why a "Granny Knot" comes undone. This latest research by UC Berkeley was interesting to me. It delved deeper and probably with more scientific vigor than most previous research into why shoelaces come undone. The findings mostly bolstered previous findings and anecdotal evidence about Granny Knots and excessively long shoelaces. That said, I feel that their testing was flawed in some areas, lacking in other areas, and that there was too much emphasis on the mechanics of untying rather than on the primary reason that so many people suffer from shoelaces that come undone – the Granny Knot. When people read headlines such as: "Shoe-string theory: Science shows why shoelaces come untied", or "Mystery of why shoelaces come undone unravelled by science", they'd like to come away from the story having learned why it happens and – hopefully – how to fix it. An opportunity missed. Similar Granny Knot vs treadmill experiment on a German TV program. My own video of the Granny Knot problem plus the simple solution. Detailed explanation of the Granny Knot, what causes the problem and how to fix it. Find out whether you're tying a Granny Knot with this interactive analyser. The first stage of tying a regular shoelace knot. Correctly tied Standard Shoelace Knot, which usually stays tied. This page last updated: 02-Dec-2018. Copyright © 2017-2018 by Ian W. Fieggen. All rights reserved.